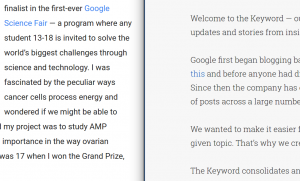 Google has launched a new consolidated central blog called The Keyword to make it easier to track Google products, research, and other activities. It will reportedly ultimately replace many other Google blogs. Because Google has long had a multiplicity of blogs to follow, this could well be a very positive move, depending on the details. This assumes, however, that you can actually read their new blog. As you can see in the comparison below, Google has once again failed users with aging or otherwise less than perfect vision. With fonts sized approximately the same, on the left I have a shot from a very recent traditional Google blog posting, and on the right the new “Who needs contrast?” version from their new blog. The difference in contrast is obvious, with the new version on the right positively painful for vast numbers of users to view. This is unfortunately not the first time Google that has gone this route with various of their products, effectively devaluing significant segments of their user population. If you talk to Google about this — and I have — they will assure you that their new designs meet visual accessibility standards and pass the associated test suites. The problem of course is that those standards are widely viewed (no pun intended) as inadequate, counterproductive, and worse. Typical human vision begins to degrade in our early 20s. A rapidly growing segment of the Google user community is being directly disadvantaged by this trend toward low contrast fonts that are impossible for these persons to comfortably read, or in some cases even read at all. Google can do far better. The Importance of "Google Assistant" and "Google Home"